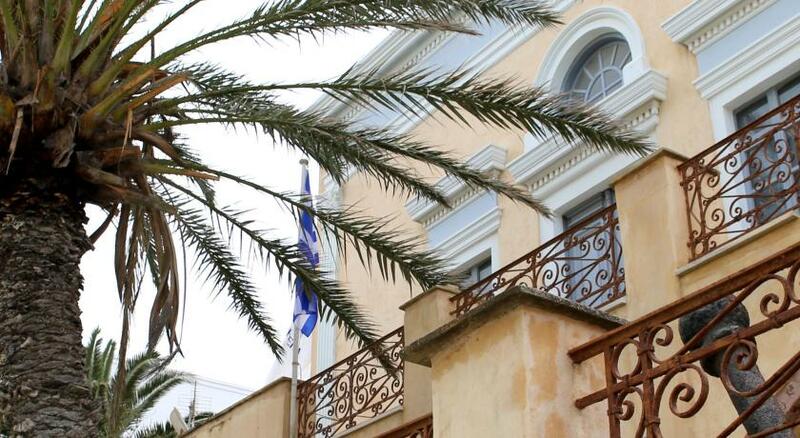 Lock in a great price for Andronis Luxury Suites – rated 9.6 by recent guests! Everything - from the reception to the check in to the warm welcome, the hotel is special because of its outstanding staff, beautiful location, unique setup, spectacular suites, great food service and wonderful concierge service. 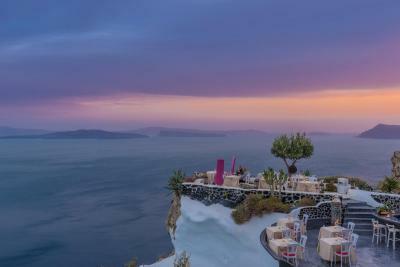 We would stay here again and nowhere else if we came back to Oia. Everything was amazing!!! The staff was so helpful and friendly. The location is perfect. Breakfast is brought to your room every morning. Beds are comfortable. Best view! What else can I say....it was the highlight of our vacation!! This was the best hotel I've ever had experience. Great view, good location and also best services. I loved the infinity pool and dinner at Lycabettus restuarant the most. Of course the price was expensive but it was worth to pay. Thank you all lovely staffs for made my honeymoon trip was perfect and memorable. The cave like rooms were unique and spacious. The staff was extremely accommodating and service oriented, the view was spectacular and pools were great. Costas is a great bartender! Wonderful service, solid accommodations. Great choice. Luxurious, incredible vista of caldera, extremely accommodating staff! Very clean. Andronis Luxury Suites This rating is a reflection of how the property compares to the industry standard when it comes to price, facilities and services available. It's based on a self-evaluation by the property. Use this rating to help choose your stay! 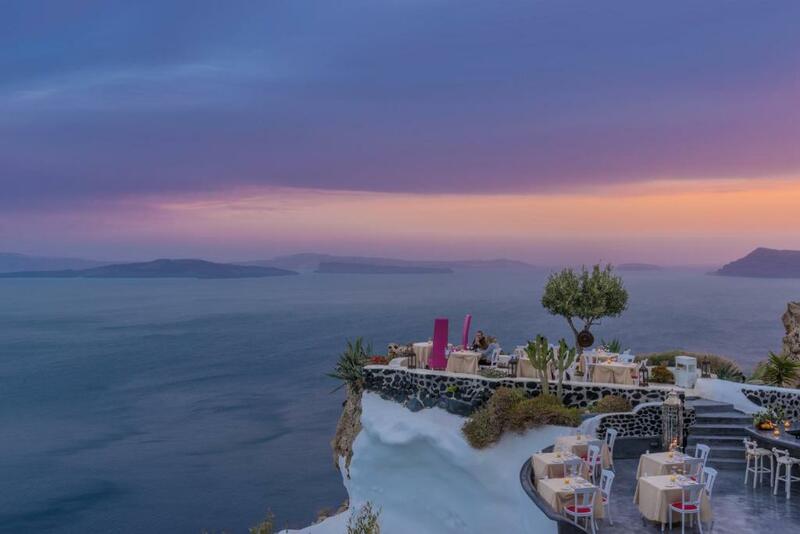 Located along the side of the Caldera cliff, with a view of the volcano, the surrounding islands and the Aegean Sea, this hotel combines classic luxury with a modern minimalist style. Commitment to a healthy and natural lifestyle is the guiding philosophy of the Andronis Luxury Suites. This concept extends from the massage room and luxury spa to the Mediterranean restaurant. Guests can savor cuisine that is freshly prepared using only organic ingredients. The Andronis Suites are literally carved into the cliff, creating an authentic and charming home base for guests' stay. The design of the suites combines traditional Cycladic and contemporary styles. Guests can relax in the atmosphere of their elegant suites, featuring hot tubs and views out over the island. The Andronis Suites' convenient location allows guests to be close to the crowds of Oia, but to still enjoy some peace and seclusion. When would you like to stay at Andronis Luxury Suites? The 344-ft² suite offers Aegean Sea views from its private balcony. The Premier suite includes a private hot tub and bathroom with shower. The open-plan Grande Suite of nearly 500 ft² features a king bed and an elegant living room with an indoor hot tub, a spacious bathroom with a shower, and a large private porch with incredible views of the Caldera. Featuring an indoor hot tub and unobstructed sea views, this suite includes a spacious bedroom, a living room and a bathroom with a shower. A 3rd guest can be accommodated upon charge. This one-bedroom, at 75m2, provides luxury, comfort and intimacy. The roomy accommodations consists of of a bedroom with walk-in closet and ample bathroom that opens onto the living area. The suite’s private terrace with an infinity heated pool frames an beautiful view of the caldera. This 861 ft² elegant suite features a spacious porch with a private infinity outdoor pool of 431 ft², a hot tub, lounge chairs, walk-in closet and jet shower. The porch offers views of the Aegean Sea and volcano. Featuring a hot tub, this suite includes a spacious bedroom, a living room and a bathroom with a shower. Offering panoramic views of the Caldera, this spacious villa features an outdoor jetted tub, and includes 2 bedrooms with a king-size bed, 2 bathrooms and a walk-in closet. -a terrace of 700 ft² (65 m²). It is on Milostufili Hill and offers access to the facilities at any of the Andronis Exclusive Hotels. Butler service is standard, as well as transportation to and from the hotel. -a terrace of 80 m². It can accommodate an extra guest upon charge. The White House features a private infinity pool with Caldera views, an outdoor hot tub and waterfall. You will find a double bedroom, an airy living area with sea views and a bathroom. The house is set on a 200 m2 terrace where you can enjoy a private dining. Offering unobstructed Caldera views and an outdoor hot tub, this one-bedroom suite includes a spacious living area, walk-in closet and amble bathroom. This suite features a balcony, sofa and bathrobe. This suite has a balcony, satellite TV and bathrobe. House Rules Andronis Luxury Suites takes special requests – add in the next step! Andronis Luxury Suites accepts these cards and reserves the right to temporarily hold an amount prior to arrival. Due to the particular construction of the hotel (on the cliff), the hotel does not accept children under the age of 13 years old for safety reasons. Guests are required to show a photo identification and the credit card they used for the reservation upon check-in. Kindly note that for reservations of more than 3 rooms, different policies and additional supplements may apply. Nothing, we loved everything about it. Would be nice to have a small gym on the propert. At least a few cardio machines. Beautiful facility in beautiful location. Butler (Sofia) and all Staff’s support and friendliness was absolutely the best part. Perfect balance of respecting your privacy while ensuring every need is met. There is no sunset view from hotel it only short walk. Must be comfortable with taking lots of steps. Everything. The staff are so wonderful, and so helpful & detailed from pre-arrival, arrival (taxi called them ahead and so the staff waited for us to collect our luggage and guide us to the hotel), during our stay no ask was too big or too little, the concierge can book you anywhere and do anything for their guests, to departure which was so sad! They really over deliver- you get what you pay for here, the service and facilities are immaculate. The view is incredible, it will take your breath away, as is the pool and entire hotel basically. Our room had an amazing separate private terrace with mini pool/hot tub overlooking the cliff and we had breakfast here every morning - this was the most indulgent and luxurious experience ever. The breakfast food is amazing and 100% worth getting included. There really are no words to describe how much we loved our stay here. It will be a highlight forever.. it is unforgettable. And worth it! If you go to Santorini, your should expect "a lot" of stairs by default. This hotel is the clearly one where going down is not an issue, but coming up... not an issue if you are a sporty person (yes for me!). One note: Oia is on the turning point of the caldera so two points: a) the hotel is not exposed to the sun past 5pm; and b) in some occasions, during sunny days, there is no wind and the hotel get really hot. The hotel is all about the rooms (lobby is not really there), bu the staff will make your day: you will not get a warmer welcoming reception anywhere else. They did everything to please us (and we are not high maintenance) including an upgrade for our last night. Location is impeccable. I left my clothes in mess on the sofa when i left the room in the morning. However, when i was back my room was cleaned , but my clothes were still in the same muddle position. I was a bit disappointed regarding this. 눇I think the best hotel I ever stayed at. The staff was so friendly. The location was perfect to the t. The pink chairs were the most romantic scenario ever. Will definitely go back and only stay here.